Ever since the first game, Mass Effect has always been about shaping the story the way the player wants it. Through Shepard's actions, players could create millions upon millions of iterations of the same universe. We decided to take a look back at the series—specifically, on some of the decisions our Shepards had to make on the way to becoming the galaxy's most badass warrior. Caution: A huge amount of spoilers for all three games follow. Note: This article assumes that every squad member was present, loyal, and survived in Mass Effect 2. Spacer: Shepard was raised on ships and space stations by his Alliance soldier parents. Colonist: Shepard grew up on Mindoir, a colony which eventually gets attacked by Batarian slavers. Earthborn: Shepard grew up an orphan on the streets on Earth. War Hero: Shepard, at one point, risked their life to save fellow soldiers, and single-handedly dealt with a Batarian attack on Elysium. Sole Survivor: Shepard's unit fell to a thresher maw attack on Akuze, leaving Shepard to fight for survival against all odds on his own. Ruthless: A pragmatic, brutal Shepard once sent most of their unit to their death, then killed a group of surrendering Batarians on Torfan. These choices confer unique missions, bonuses to Paragon or Renegade points, and extra conversation options. Through the player's choices, Shepard can become a shining example of the best of humanity, a compassionate, heroic Paragon. Or, Shepard can be a brutal, calculating Renegade who stops at nothing to get the job done. Opold, a Hanar merchant, asks Shepard to help him smuggle in an illegal weapon mod. Agreeing to do so and giving his package to Administrator Anoleis gets Shepard a garage pass. Lorik Qui'in, a local businessman, can be talked to. He tells Shepard that Anoleis is corrupt, and there's evidence of this on a computer at his offices. Shepard has to retrieve the evidence for Lorik in exchange for a garage pass. Gianna Parasini, Anoleis' administrative assistant, at one point reveals herself as an undercover investigator trying to prove Anoleis' corruption. In exchange for convincing Lorik to testify against Anoleis, Parasini hands Shepard a garage pass. Shepard can also either give Anoleis the evidence against him for a garage pass, or reveal Parasini's identity to him. In this case, they shoot each other and a pass can be looted off Anoleis' dead body. On Peak 15, Binary Helix, a corporation controlled in part by Saren, has been cloning Rachni, a long-disappeared race of deadly insectoids. Saren plans to use the cloned Rachni as soldiers. Their queen can be found after dealing with Matriarch Benezia, Saren's assistant. The queen can either be destroyed outright, or let go. Shepard arrives on Feros, looking to investigate why Saren sent Geth to attack the planet. Exogeni Corporation, the people who founded Zhu's Hope, the Feros colony Shepard landed the Normandy at, have ordered their local representative, Ethan Jeong, to purge the colony to get rid of any evidence of their practices. He can be convinced that the colony is still worth something to Exogeni, at which point he'll back down; or, he can simply be shot. The Thorian, an ancient mind-controlling creature living under Zhu's Hope, has taken control of the colonists who need to be neutralized somehow. Shepard can choose to incapacitate them with melee attacks or special nerve gas grenades, or kill them outright. The Thorian has also been using a green-skinned Asari as a template for cloned soldiers. Shepard can decide that she's too dangerous to let live, or let her go. A group of batarian terrorist hijacked an asteroid, and are trying to crash it into the human colony world of Terra Nova. Their leader, Balak, when confronted, offers Shepard a choice: either let him go, or fight him at the cost of the lives of his hostages, whose cell he has booby-trapped with explosives. Shepard travels to Virmire in search of a Salarian recon team who has information on Saren. Here, it is revealed that Saren has found a cure to the Krogan's artificial genetic disease, the Genophage, and is using it to breed an army of Krogan. They agree that the cure needs to be destroyed, but Wrex, Shepard's Krogan squadmate, is furious at this. He can be convinced to follow Shepard into battle; otherwise, he has to be killed. Shepard and the crew plant a bomb in Saren's facility to destroy it. Squadmates Kaidan and Ashley play important roles here: one of them leads the Salarian recon team, while the other arms the bomb. 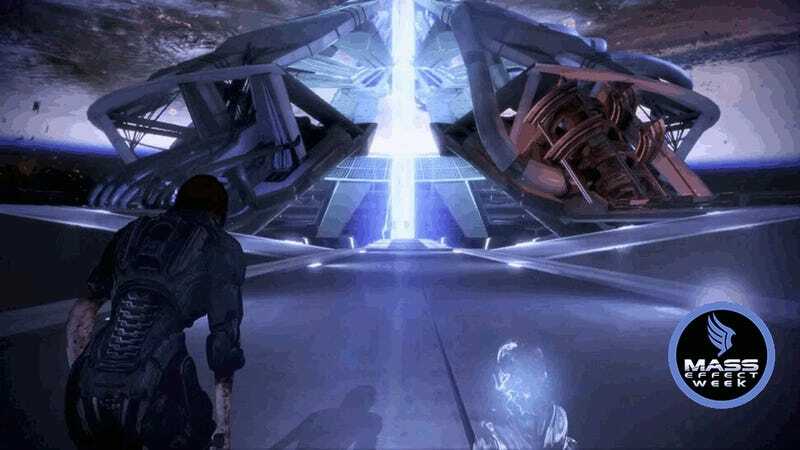 The Geth begin to overwhelm the two groups, and Shepard needs to decide whether to save Ashley or Kaidan. The one left behind dies in the bomb blast. In the battle for the Citadel at the end of the game, the fleet's flagship, the Destiny Ascension, with the Citadel Council on board, gets under a lot of fire from the Geth attackers. Shepard can order the fleet to assist the Destiny Ascension, saving both the ship and the council. Alternatively, the fleet can be ordered to focus on the Reaper leading the Geth, Sovereign, in which case the council is lost. The original council is lost, and a new one is formed. Whether this is a multi-species council or a human council depends on Shepard's renegade score. Shepard can then recommend either Ambassador Udina or Captain Anderson to be the chairman. The council is saved, and they offer humanity a seat. Shepard has to name either Udina or Anderson humanity's representative. Shepard heads to the human colony of Freedom's Progress to find out what happened to its inhabitants, who suddenly disappeared. They are met with resistance from the colony's mech defense force. Veetor, a Quarian, who gave the mechs the command to attack because he feared for his life, is confronted at the end of the mission. He can be sent back to the Migrant Fleet to recover, or shipped off to Cerberus for interrogation. Mordin has to head to Tuchanka, the Krogan homeworld, to rescue a former colleague of his, Maelon, with whom he has worked on the Genophage. There, he discovers that the mercenaries who took him didn't actually take him; he agreed to work with them on a cure, out of guilt for what he's unleashed with the Genophage. At this point, Mordin will try to shoot Maelon. Shepard can convince him not to. Then, Shepard can decide what to do with Maelon's data. Mordin can be told to save it, or destroy it. Jacob receives word of a distress call originating from the planet Aeia, where the ship his father, Ronald Taylor, served on crash-landed. While exploring the crash site, Shepard and Jacob discover that at one point, the ship's officers and crew were divided into two groups, with the officers hoarding all the food. The crew had to survive on the toxic plantlife, which eventually rendered them either amnesic or insane. Ronald, the only officer left, ruled over the survivors using the remaining mechs. Eventually, Shepard and Jacob confront him. Ronald can be taken into custody, and sent off to prison. He can also be left on the planet at the mercy of the remaining crew, potentially with a gun he can use to commit suicide before the crew can get to him. Miranda's father is planning to kidnap her sister, Oriana, and she asks for Shepard's help with getting rid of her kidnappers. They ultimately succeed, and Oriana can continue her life—albeit without knowing who helped her. Miranda can be convinced to give up the facade and reveal herself to her. Jack travels to Pragia, where she was experimented on by Cerberus as a little girl. There, they find Aresh, a fellow survivor of the experiments who plans to restart the facility. Shepard can convince Jack to let Aresh go, or order her to kill him. Garrus finds out that Sidonis, the man who betrayed him and got his team killed on Omega, is on the Citadel. He asks Shepard to help lure him out and kill him. Before he actually pulls the trigger, Shepard can convince Garrus to let Sidonis go instead. Samara asks for Shepard's help with tracking down her Ardat-Yakshi daughter, Morinth. Since Ardat-Yakshi are essentially vampires, and huge dangers to society, she needs to hunt her down and kill her. Eventually, Samara and Shepard confront Morinth. Shepard can decide to help Morinth, which results in Samara's death. In this case, Morinth gets to join the Normandy's crew, posing as Samara. Otherwise, Samara kills Morinth, making the mission a success. Tali has been sending Geth components to his father for research purposes. Unfortunately, the Geth awaken and slaughter the research team, along with Tali's father. Tali gets charged with treason for smuggling Geth into the Quarian fleet. To clear her name, Shepard and Tali search the research ship, and find evidence that can prove Tali didn't do anything wrong, but would condemn her father. Shepard and Tali meet the Admiralty Board shortly after to discuss the charges. Tali doesn't want her father's reputation ruined, so she asks Shepard not to tell the Board about the evidence. If Shepard complies, Tali is exiled. Shepard can also agree to present the evidence, upon which Tali's father is posthumously exiled. This makes Tali very angry. Alternatively, Shepard give a speech, persuading the Board that a person like Tali would never be able to betray her own people. This way, Tali's name is cleared and her father's reputation is preserved. Legion tells Shepard that the Geth heretics, a faction of Geth fought in Mass Effect 1, are trying to convert the other Geth to the Reaper cause by unleashing a virus into the collective from a space station. Eventually, the virus is stopped—at that point, Shepard needs to decide to either rewrite the heretics' behavior to strengthen and unify the Geth, or destroy the station, and the heretics with it. Zaeed's mission takes him and Shepard to a refinery on Zorya, which has to be liberated from Blue Suns, a group of mercs Zaeed has co-founded. While there, they find Vido Santiago, long-time rival to Zaeed and the other co-founder of the Blue Suns. The two get in a gunfight, with Zaeed shooting a gas pipe and unleashing an explosion, injuring Vido. This starts a chain reaction which threatens to destroy the refinery and kill its workers. If Shepard chooses to chase Vido, the refinery workers all die, but Zaeed is able to kill Vido. If Shepard saves the refinery, Vido manages to barely escape, and Zaeed has to be convinced to stay loyal to Shepard. Kasumi goto asks for Shepard's help with retrieving something from Donovan Hock, an arms dealer who's killed her partner, Keiji. The object in question is a greybox, which stores Keiji's memories. After finding and examining it, Shepard and Kasumi discover that there is a lot of sensitive information within which, if found, could be very dangerous in the wrong hands. However, Kasumi is reluctant to destroy the greybox due to her ties with Keiji. Shepard can convince her to either destroy or keep it. Shepard and the Normandy's crew are sent to investigate a Cerberus station which has ceased all communications with the outside world. There, they find that David Archer, the autistic brother of one of the researchers, Gavin Archer, has been merged with a Virtual Intelligence program designed to control Geth. The VI program goes rogue and the Geth control group begins destroying the station. Shepard eventually finds David deep within the laboratory, hooked up to painful-looking machinery, with his brother watching over him. Shepard can choose to take David from Gavin to prevent any further abuse, and send him off to Grissom Academy, a school for gifted youth. Alternatively, David can be left in the hands of his brother. This allows the project to continue. At one point, Jack will get into an argument with Miranda, who refuses to admit that what Cerberus did to Jack when she was a child was wrong. Shepard can take sides, telling either of them to back off, although this will cause the one in question to become disloyal. Shepard can also convince them both to put aside their differences for the mission. Like Jack and Miranda, Legion and Tali also have a fight. Tali finds Legion accessing her omni-tool and trying to send Quarian data to the Geth. Legion insists that he's doing this only to help keep his people safe. Again, Shepard can tell one to back off and leave the other alone, or make peace between the two—in this case, Legion agrees not to send any sensitive data to the Geth, and Tali decides to help him. While Shepard is away on a mission, the Normandy comes under attack from a Collector cruiser, and her crew, save for Joker, is taken. Shepard has to decide whether to go after them immediately, or delay and do a few more missions first. Doing more than one mission after the crew's abduction results in the death of either several, or all crew members (save for a sole survivor, Doctor Chakwas). Throughout the Suicide Mission through the Omega Relay, Shepard needs to assign squad mates to various tasks, to be carried out within and around the Collector Base. Some are better fit for biotics, others for natural leaders. Depending on how good a fit the chosen squad members are for their particular tasks, they can either survive or be killed in action. If things go wrong enough, even Shepard can die, which leaves Joker the only survivor of the mission. At the end of the final mission, Shepard is contacted by the Illusive man, who says the technology on the Collector Base could be used against the Reapers. Shepard has to decide whether to keep the Base, merely setting off a radiation pulse to kill the Collectors, or destroy it. On Shepard's first visit to the Citadel after the Reaper attack on Earth, they're approached by Alliance News Network correspondent Diana Allers. She wants to join the Normandy's crew to report from the front lines of the Reaper war. Should Shepard say yes, she will move onto the Normandy and will occasionally interview crew members (and Shepard). Otherwise, she joins another ship. Shepard investigates Grissom Academy after finding out that they're under Cerberus' attack. After evacuating the students, Shepard can decide where to send Jack, who works as an instructor there, and her class. They can be used as support for other troops, which is safe, or sent off to the front lines to fight, which is considerably more dangerous. A Krogan team has gone missing, and Shepard is tasked with finding it. They are found on the planet Utukku, under attack by Reaper-controlled Rachni. Grunt, the Krogan squad mate from the second game, is leading them. Shepard and the Krogan fight their way to the source of the Rachni, the Rachni Queen. Shepard has to choose between saving the Rachni Queen by sacrificing the Krogan team, or leaving the Queen to die and rescuing the Krogan team instead. Shepard searches for a vanished Asari commando unit who went to answer a distress call from an Ardat-Yakshi monastery. There, Shepard finds Samara, who is searching for her two other Ardat-Yakshi daughters, Rila and Falere. Rila ultimately stays behind to detonate a bomb left behind by the commando unit to destroy the monastery, which is now filled with Reaper-indoctrinated Ardat-Yakshi. Shepard, Samara and Falere manage to escape—however, Samara's Justicar code disallows her from letting Ardat-Yakshi run free. Because she would have to kill her own innocent daughter, she resolves to commit suicide. Shepard can choose to intervene, which results in Samara going back to fight in the Reaper war, and Falere staying on the planet to rebuild the monastery. Shepard can also let Samara pull the trigger. Afterwards, Falere can be deemed a risk and killed, or left alone. Shepard is asked to investigate Din Korlack, the Citadel's Volus ambassador, for ties to Cerberus. He is found captured by a group of bounty hunters, Zaeed Massani among them. Shepard and Zaeed rescue Korlack, who tells them that Cerberus plans to attack a Turian colony. He refuses to reveal which one, however, afraid that Cerberus will find him. Instead, he offers the support of the Volus fleet against the Reapers. Shepard can either ask for the fleet, or insist on getting the colony's location. If Shepard is persuasive enough, both the location of the colony and the fleet's support can be gained. Shepard and Aria T'Loak head to Omega to free it from Cerberus control. There, they join up with Nyreen Kandros, leader of a local rebel gang. While on their way to confront General Oleg Petrovsky, the local Cerberus leader, the trio gets trapped under a force field. Shepard manages to escape, and reaches Omega's reactor. Here, Shepard has to choose whether to immediately kill the power, freeing Nyreen and Aria instantly but putting thousands of civilians in danger by turning off life support, or slowly reroute the power, putting Aria and Nyreen under heavy fire. Ultimately, either choice leads to the two surviving. There are several ways to deal with General Oleg Petrovsky. Shepard can convince Aria to let him live, which results in him getting taken away for interrogation. Shepard can also let Aria have the general, who gives him a slow, painful death. Alternatively, Shepard can shoot Petrovsky in the head. Before taking on the mission to supply the cure to the Genophage to the Krogan, Shepard is approached by the Salarian Dalatrass. She reveals that the Shroud, the facility used to disperse the cure, has been sabotaged by the Salarians to prevent a cure from being distributed. She offers her co-operation in the war effort in return for Shepard making sure the sabotage remains hidden. Shepard can tell Mordin about the Dalatrass' plan, though Mordin will realize there is something wrong with the Shroud by himself. He disperses the cure over the planet, sacrificing himself in the process, securing Krogan support for the Reaper war, but losing the Salarians. Mordin can be prevented from fixing the sabotage, either by shooting him. This results in the Dalatrass pledging the support of their First Fleet to the war effort. Wrex will eventually find out about the cure failing, and has to be killed. Shepard's orders take him to the Perseus Veil, to help the Quarian Migrant Fleet fight against the Reaper-controlled Geth forces. Eventually, Shepard finds Legion on the Geth flagship, who is being used to transmit the Reaper signal to the Geth against his will. After purging the Reaper code from the Geth collective and destroying the Reaper base on Rannoch, the Quarian homeworld, Legion tells Shepard that he plans to apply his own version of the Reaper code to the Geth, in an effort to achieve true intelligence. Tali is very much against this. At this point, Shepard can side with the Geth. They receive their upgrades, and wipe out the Migrant Fleet. Tali, betrayed, commits suicide, while Legion uploads his own personality code into the collective, effectively sacrificing himself. If Shepard chooses to side with the Quarians, Legion becomes angered and attacks Shepard. The Quarian forces wipe out the remaining Geth ships. A third option is available: Shepard can negotiate a ceasefire. The Migrant Fleet stands down, and the Geth join the Quarians in repopulating Rannoch. While on the Citadel on shore leave, Shepard is targeted by ex-Cerberus agent Maya Brooks, who tries to use a Cerberus-created clone of Shepard to gain control of the Normandy and use her and her crew to her own purposes. She fails, and is set to be taken away to prison. Naturally, she tries to escape. Shepard has two choices: talking her into going to prison peacefully, or killing her. Shepard's shore leave concludes with a huge party. After sending out the invitations, Glyph, Liara's personal assistant AI who's organizing the event, asks what type of party Shepard would like to throw. A Quiet party will be more conversation-based, while an Energetic party will be more wild. Shepard's consciousness is uploaded into the Reapers, putting them under Shepard's control. The Reapers help the galaxy rebuild and serve as guardians. Shepard merges with the Crucible, creating a new type of DNA which replaces all life in the galaxy with a unique organic/synthetic hybrid. This way, there is no need for the Reapers to wipe out all life anymore, since the chaos of organic life is eliminated. The Reapers help the galaxy rebuild and share their knowledge with the races. Shepard destroys vital equipment on the Citadel, which sends a pulse through the mass relays, reaching everywhere in the galaxy. The pulse damages the mass relays and wipes out all synthetic life, Reapers included. There's a chance of seeing Shepard wake up in a pile of rubble on Earth afterwards if this choice is taken. Shepard can also refuse to make a choice. In this case, the Reapers continue their work, and wipe out all organic life in the galaxy. Over to you, folks. Do you still remember how your actions shaped the Mass Effect universe? What are your most treasured memories? We'd love to hear from you in the comments.